1. - Hopper-chest-hopper-oven: not even enter some hoppers activating the comparator. 2.- Hopper-dispenser-hopper-oven: Enter item and all is well distributed. 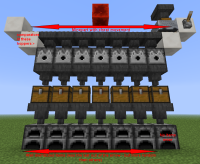 3.- Hopper-hopper-hopper-oven: Enter item and distributed by all good (except for the first hopper) although comparators hoppers are turned on and off very fast. 4.- Hopper-dispenser-hopper-chest-hopper-oven: Enter item and all is well distributed (although the distribution is worse than in case 2). NOTE: In all cases the first hopper NEVER enter item. IMPORTANT: For more details, look at the pictures. And finally, I guess that may be my problem distribution system, speed or other cause... about the possibility of "other cause" is what I report this possible bug. MC-7985 Hoppers play favourites based on cardinal directions.